FSP presents the second watercooled power supply unit coming from the success of the Hydro PTM+1200W PSU – the Hydro PTM+ 850W. The FSP Hydro PTM+ 850W hits the perfect balance of value and capacity that most enthusiasts and builders need. It features 80PLUS platinum rating with up to 92% efficiency, RGB lighting, and watercooling components co-developed with Bitspower. The Hydro PTM+ 850W runs silent with passive cooling up until 425W load. It comes with standard G1/4” connectors which work for both hard tubing and soft tubing. RGB lighting is certified to be compatible with the ASUS Aura Sync for synchronized RGB lighting with other Aura Sync-enabled components. Internally, the Hydro PTM+ 850W is made of only the best components such as 100% Japanese made capacitors for reliable power and have a prolonged lifespan. The design uses a single 12V rail with a DC-DC module for maximum efficiency and stability. This allows for the extremely high 92% efficiency rating and 80 PLUS Platinum certification. Over-current, over-voltage, and over-temperature protection provide safety and stability. While rated at 850W, with liquid-cooling enabled, the Hydro PTM+ 850W is able to deliver up to 1000W. The FSP Hydro PTM+ 850W power supply is now available at partner resellers worldwide with an MSRP of $399 USD. 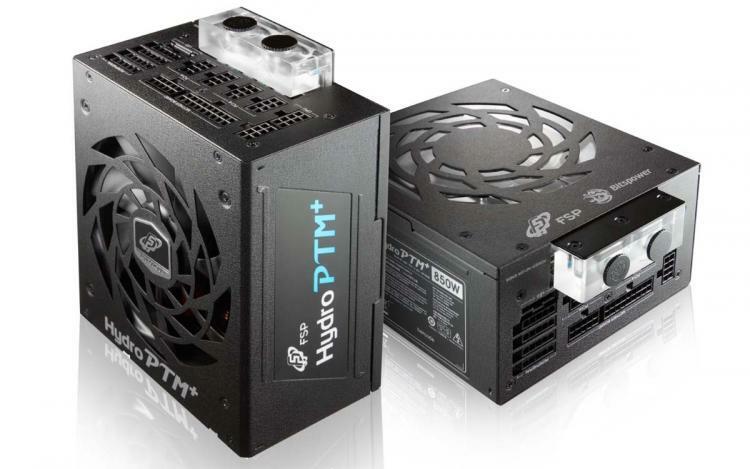 Learn more about the Hydro PTM+ 850W PSU here.